These Moroccan design crocks are brimming with our luscious Strawberry Preserves (gift #4254, 20 oz.) 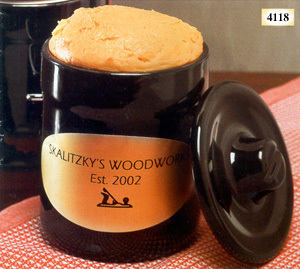 or Cheddar Cheese Spread (gift #4258, 18 oz.). A great gift for sharing with the office or family! The wooden lid can be laser engraved. Shipping weight: 3 lbs. Measures 3 3/4” diameter x 5 3/4”. Case pack: 6. Prices shown per piece. Engraving area: 2 ¾” diameter. This glossy black ceramic crock holds a creamy eight (8) ounces of Extra Sharp Cheddar cheese Spread. Make sure you always have some on hand! Shipping weight: 4 lbs. Measures 3 3/4” diameter x 6”. Case pack: 6. Prices shown per piece. 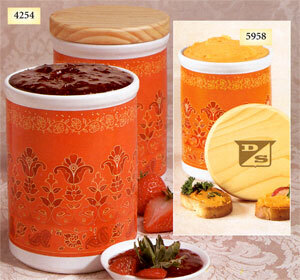 Two sizes of either Cheddar Spread or pure Strawberry Preserves are available in these contemporary crocks. All crocks may be label imprinted. Shipping weights: 4210/4215 and 4200/4205: 4 lbs. ; 4435/4440: 6 lbs. 4425/4430: 7 lbs. Case pack: 12. Prices shown per piece. Label size for Gifts 4215 and 4205 is 4” x 1 1/2”. 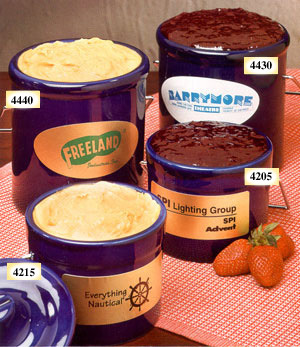 * No set up charge for imprinted labels! ** Set up charge for Laser Engraving and Foil Stamped Ribbon: $25.00.